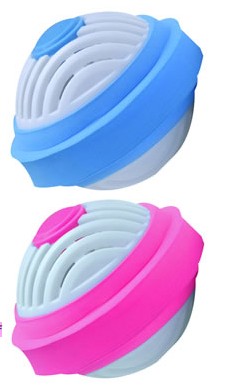 The Robby Wash Laundry Ball by Oransi is a convenient and "green" way to do your wash. If you live in an apartment complex on the second floor or even higher (like I used to) than you will love this product also! No lugging heavy bottles of laundry detergent up and down steps, or even if your laundry is in the basement of your home (like mine is now). You simply throw the ball in with your clothes, that simple! No measuring, no worries about spilling any liquid etc. It's very fast and easy and does a great job getting your clothes clean and it also makes them smell fresh. 1) It only costs on average 27 cents to use every time you do a wash.
2) It comes with three refills and a free stain stick. 3) The contents of one box will last 120 washes – but the ball itself will last 3 years and you only have to buy soap pellet refills – saves the environment by cutting down on plastic waste. There are little balls inside that release molecules that wash and dissolve any dried in stains. It is environmentally friendly because you are not constantly discarding plastic bottles or boxes! One lucky winner is going to receive an Oransi Wash Ball of their own! I did not receive any financial compensation for this review, I did however receive free product for the purpose of this review. All opinions are my own. I'd actually LOVE to try this wash ball! but the fridge purifier is a close second. thank you for this giveaway - I've always wanted to try one of Oransi's products.